Who Rules The Rackets ? This picture puts the finger on the political higher-ups! "They rule by the fear of their guns. They must be stopped by the power of your ballots." They refers to Bugs Fenner and other mobsters whose illicit rackets will be smashed to smithereens by undercover cop Johnny Blake. When Warner Bros.' Depression-era gangster movies began to draw protests, the studio reinvigorated the genre with stories emphasizing law enforcers instead of lawbreakers. 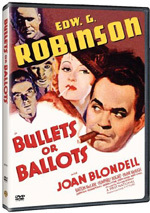 The swift, sturdy Bullets or Ballots reflects that, with Edward G. Robinson (as Blake) siding with the good guys for the first time in a gangland saga. Humphrey Bogart plays the short-fused Fenner. And Joan Blondell and Louise Beavers, in an unusual story element for the times, are thriving numbers operators whose grift is usurped by the mob. Two of the silver screen’s most famous tough guys appear together in 1936’s Bullets or Ballots. 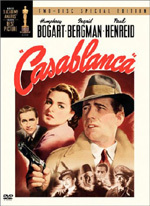 We find both Edward G. Robinson and Humphrey Bogart in this flick, though here each one stands on an opposite side of the law. Ballots introduces us to notorious racketeers Al Kruger (Barton MacLane) and “Bugs” Fenner (Bogart). These scumbags consistently evade prosecution as they wheedle money from honest citizens. When anti-racketeer crusader Ward Bryant (Henry O’Neill) gets too vocal in his attacks on the thugs, Fenner offs him against Kruger’s wishes. This attempt to quash public criticism backfires, as it just serves to further agitate the forces for good. That crew includes Johnny Blake (Edward G. Robinson), an aging detective who doesn’t work on big cases any more. This irritates cabaret performer/small-time numbers runner Lee Morgan (Joan Blondell). She thinks the town needs Blake and his boys to bring down the truly onerous criminal elements. In the aftermath of the Bryant murder, a police crackdown takes place. Newly-appointed Commissioner McLaren (Joseph McLaren) takes charge of this. Blake isn’t part of the plans, though, as the force fires him due to “inefficiency”. This sends Blake to Kruger since the racketeer had a long-standing offer of a job. The movie follows his work with the crooks and how this intersects with police operations. Should you expect anything particularly unusual or unexpected from Ballots? Nope, I don’t think so. Whatever plot twists it offers come from a mile away, and the film lacks much to make it stand above the typical gangster flick of the era. Actually, Ballots did present some unusual elements. Apparently this was Robinson’s first “good guy” role, as he played crooks in prior flicks. The Lee character also presents something intriguing as she straddles the worlds of regular society and criminal enterprises. That said, I can’t claim I find much here that takes me by surprise. Nonetheless, I can state that I think Ballots works just fine for what it attempts. The movie’s twists and turns may be predictable, but they keep us interested. We may know where the story will go, but it creates an enjoyable journey along the way. I do like the way the movie presents its exposition. Ballots uses a simple newsreel to do its job. Many flicks would work the same way, but the fact it puts characters in the audience as they watch the film makes matters more creative. While this still comes across as obvious exposition, I appreciate the effort put into the unusual format. Ballots occasionally suffers from a meandering story, primarily during its first act. As we get into the various elements, the plot tends to putter around without a great deal of focus. This still occurs during the rest of the movie, but not to the same degree. Once Blake joins the crooks, matters tighten up and give us a clearer focus. I like Robinson’s casting. It’s fun to see him in a change from his usual gangster part, though that background helps when he hooks up with Kruger’s group. An actor with a more goody-two-shoes image wouldn’t be able to pull of the shift, but we easily believe Robinson as a cop gone bad. Many will be attracted by the combination of Robinson and Bogart, and they don’t disappoint. Since their characters dislike each other, they get opportunities to tangle. Sparks fly between the two when they go up against each other, and those moments help make the film work. Ultimately, Bullets or Ballots doesn’t go down as a particularly innovative or clever crime drama. It won’t qualify as one of the genre’s greatest works. Nonetheless, it provides a quality piece of entertainment that keeps us intrigued for its entire running time. 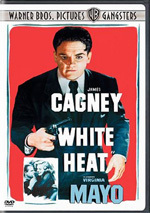 Bullets Or Ballots appears in an aspect ratio of 1.33:1 on this single-sided, double-layered DVD; due to those dimensions, the image has not been enhanced for 16X9 televisions. Warner Bros. usually does a nice job on their transfers for older movies, and Ballots stood as an example of that. Sharpness came across well. Only a smidgen of softness cropped up in the occasional wide shot. The majority of the movie exhibited nice delineation and clarity. I saw no issues with jagged edges or shimmering, and I also noticed no edge enhancement. Blacks were dark and dense, while shadows came across as nicely clean and smooth. The movie offered a good silvery sheen, as it exhibited solid contrast. Source flaws were surprisingly minor. Occasional marks cropped up, and I noticed a few blotches as well. These were infrequent and much less prominent than expected. I found a lot to like in this terrific transfer. While not quite as strong, the monaural soundtrack of Bullets or Ballots was fine for a product of its era. Dialogue showed examples of edginess at times, but the lines weren’t terribly brittle. They always remained easily intelligible and suffered from no real problems. Effects seemed tinny due to their age, but they didn’t present any distortion as they offered more than acceptable fidelity. Music was a minor element. Its instances came across as too bright, but again, I expected that, and didn’t find the music to come across as problematic. Hiss was noticeable at times, though not on a consistent basis. Overall, while this wasn’t a stellar soundtrack, it worked more than acceptably well for its age. Quite a solid set of extras fills out Ballots. We start with an audio commentary from film historian Dana Polan. He provides a running, screen-specific discussion. Polan digs into the origins of the story and its development, differences between the script and the final film, and the Warner Bros. style at the time. We also learn about themes and interpretation, pacing and editing, characters and cast, and various production notes. Polan gives us a more introspective commentary than usual. He offers a lot of interpretation as he relates how Ballots fits in with other Warner flicks of the era. He still tosses out good background about the production; I especially like the notes about how Joan Blondell had run-ins with the brass at Warner. This is a consistently informative and useful chat. A creative and fun addition to the set, Warner Night at the Movies attempts to replicate the cinematic experience circa 1936. This feature starts with a preview for The Charge of the Light Brigade. We also get a period newsreel, an animated short called I’m a Big Shot Now and a live-action musical short entitled George Hall and His Orchestra. These are the kinds of pieces that might have preceded a theatrical showing of Ballots, so if you activate this feature, you get an attempt to duplicate a night at the cinema. I like this concept and think it’s quite clever. Next comes a new featurette called Gangsters: The Immigrant’s Hero. This 20-minute and 55-second piece features movie clips and interviews. We get notes from film historians Eric Lax, Drew Casper, Rick Jewell, Vivian Sobchack, Anthony Slide, Lincoln D. Hurst, and Patricia King Hanson, directors Lili Fini Zanuck, Larry Cohen and Martin Scorsese, producer Irwin Winkler, screenwriter Nicholas Pileggi, and actors Michael Madsen and Talia Shire. 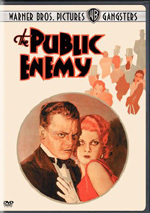 The program looks at how new Americans viewed gangsters in the Thirties. We see how immigrants and gangsters were depicted in film and various elements of the era and the characters’ appeal. We also get some information about specific actors. While not packed with detail, “Hero” offers an intriguing view of the gangster film era. It’s not a typical take on the topic and provides an interesting historical take on things. Don’t mistake this for a serious document but it gives us some good notes. Another vintage featurette pops up after this. We find How I Play Golf by Bobby Jones No. 10: Trouble Shots. The 10-minute and 40-second program shows the legendary golfer as he offers some tips. We see Jones with actors Edward G. Robinson, Joe E. Brown and Douglas Fairbanks. It’s fun to see from a historical point of view and more entertaining than I expected. For an “audio-only” feature, we discover a 4/16/1939 Lux Radio Theater Broadcast. A recreation of Ballots, the program runs 58 minutes, 42 seconds. Both Robinson and Bogart reprise their movie roles here; Lon Kruger takes over for Barton McLane, while Mary Astor does the Joan Blondell part. Usually these radio adaptations take a lot of liberties, but this one reworks the movie in a pretty literal sense. Since the flick was so short, they didn’t need to cut much. For reasons unknown, they change Bugs’ last name from “Fenner” to “Brenner”, but otherwise, the two seem pretty similar. The radio show is fun to hear and a good addition to the set. In addition to the film’s trailer, we find Breakdowns of 1936. This nine-minute and 32-second blooper reel features goof-ups and wackiness behind the scenes on the year’s Warner flicks. I don’t normally like bloopers, but it’s hard to resist the sight of legends like Humphrey Bogart, Bette Davis, Leslie Howard and Edward G. Robinson as they botch their lines. While not the most creative gangster movie ever made, Bullets or Ballots at least manages to remain quite entertaining. It holds up quite well after 70 years and creates an interesting view of a particular criminal element. The DVD offers surprisingly strong picture along with adequate audio and some positive extras. This is a quality release for a pretty enjoyable flick. Note that you can buy Bullets or Ballots alone or as part of a six-movie “Tough Guys Collection”. The latter packages Ballots with San Quentin, Each Dawn I Die, A Slight Case of Murder, ”G” Men, and City for Conquest. This set is a steal for folks who want to own the various movies. It retails for about $60, which equals the list price of three of the DVDs separately. It’s like a “buy three, get three free” deal and is a serious bargain.